A 21 pound lobster was recently found off of Cape Cod. 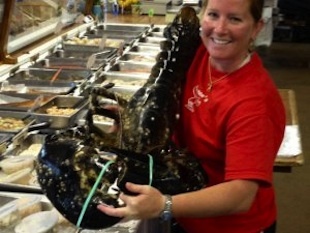 Even though this is not a record setting lobster, it's still quite a specimen. The lobster looks like one of those old prehistoric sea creatures you would find in a natural history museum. This behemoth dwarfs the 11 lb lobster that I had the privilege of seeing in person at the Montery Bay Aquarium a few years back. Because it's longer than 5 inches, it cannot be kept according to local laws, so it will probably be returned to the sea...How can one even think of eating such a magnificent beast?